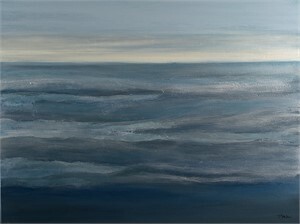 530 Burns Gallery is proud to present an exhibition of works by gallery artists inspired by glistening waterscapes. 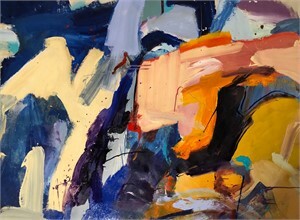 Among the featured, three Sarasota-based female artists-- Katie Cassidy, Bettina Sego and Linda Richichi-- explore the theme from ethereal abstractions to mixed-media works and “plein-air” studies. 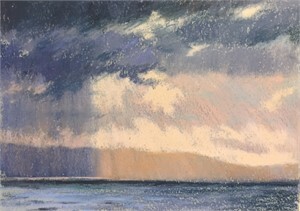 “By the Sea” runs from November 9 - December 10 at 530 Burns Gallery, 530 Burns Ln Sarasota, FL. The Opening Reception will be held at the Gallery on Friday, November 9 from 6 to 9PM. This show aims to not only highlight nature’s beauty, but also use the space as a platform for conversations about conservation and how we might better protect our environment. 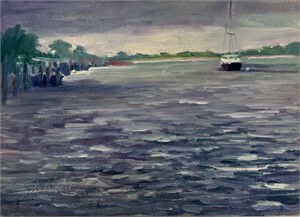 It comes naturally that the leading artists find sanctuary in Sarasota due to its close proximity to awe inspiring waterscapes. 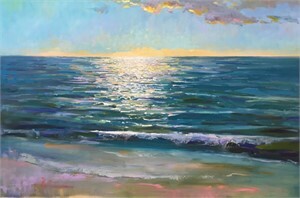 Linda Richichi says, “Since moving to the Gulf, my work continues to brighten from the ever-changing light cast across the water’s surface. 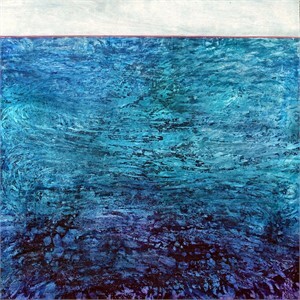 I see the evolution of a whole new color palette which explores a vast range of prismatic colors that harmoniously singing together.” The works in this show are evocative of a culture guided and captivated by the power of water. 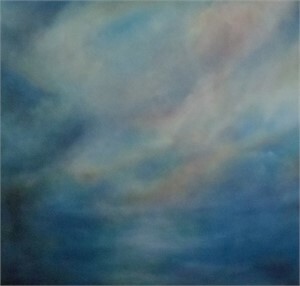 Katie Cassidy is known for her transformative oil paintings. Cassidy says, “inspired by Nature, I take the liberty of expanding and contracting what is before me. 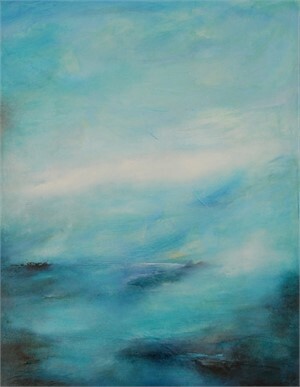 I allow myself to submerge into the imagined, uncharted, yet to be discovered, places.” Using subtle shifts in color, Cassidy obscures the brush strokes to create a sublime waterscape. 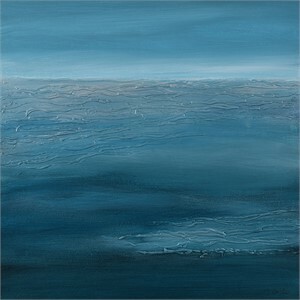 Her work takes the viewer into a new mindset, where there is an inherent calmness and sense of peace. 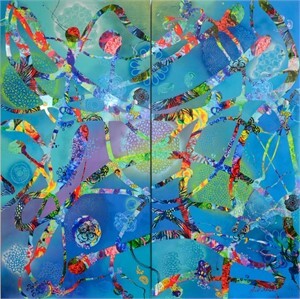 Bettina Sego is a German-American mixed media artist, using layers of ink, acrylic paint, collage, silver or gold leaf, and resin to create vibrancy and depth in her paintings. 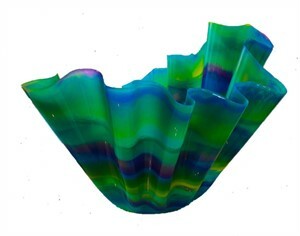 Sego takes inspiration from nature-- the minuscule fragments and layers which build to give vibrancy to natures surfaces. Sego studied in France and Germany and received a Master of Arts Degree from San Francisco State University. Moving to Florida in 2000, Sego has concentrated increasingly on impeccably combining various techniques within a natural context. 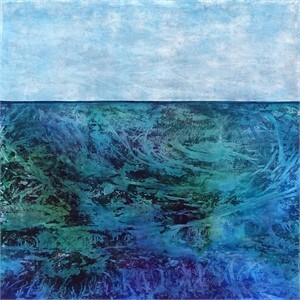 Most recently, Sego’s “Gulf” series hones in on the complexities of the waters surface and the lifeforms found within. Linda Richichi is best known for her vibrantly colored “plein air” pastel and oil paintings with layers of texture from loose brushstrokes. 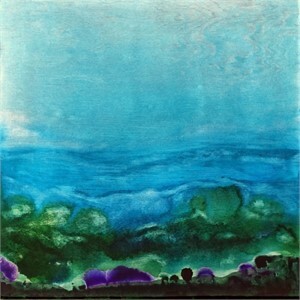 Linda continues to push boundaries and explore the spectrum of colors found throughout nature. 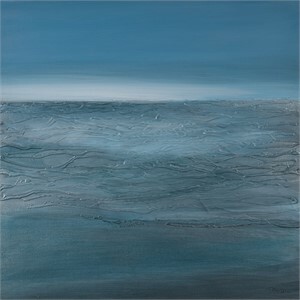 Phil Lederer of SRQ Magazine described Linda’s recent Solo Exhibition-- “Summer Solo: Linda Richichi showcases the pastel maven at the top of her form as a master of color and light, whether capturing cloud-scenes from Sarasota or the Italian countryside.” The pieces featured in this show specifically look at Richichi’s impressions of the water. For further information and press inquiries, please contact Molly Lindberg at molly@sedacca.com or by phone at 941-951-0620. 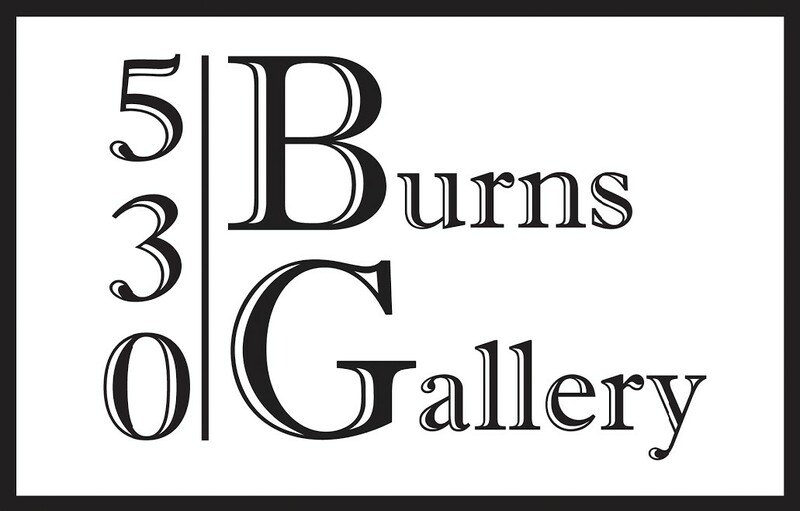 530 Burns Gallery is proud to present an exhibition of works by gallery artists inspired by glistening waterscapes. 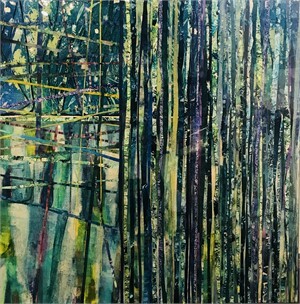 Among the featured, three Sarasota-based female artists-- Katie Cassidy, Bettina Sego and Linda Richichi-- explore the theme from ethereal abstractions to mixed-media works and “plein-air” studies. 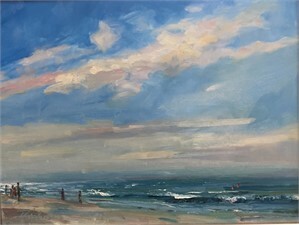 “By the Sea” runs from November 9 - December 10 at 530 Burns Gallery, 530 Burns Ln Sarasota, FL. The Opening Reception will be held at the Gallery on Friday, November 9 from 6 to 9PM. This show aims to not only highlight nature’s beauty, but also use the space as a platform for conversations about conservation and how we might better protect our environment. 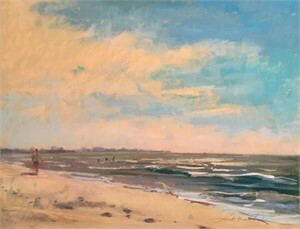 It comes naturally that the leading artists find sanctuary in Sarasota due to its close proximity to awe inspiring waterscapes. 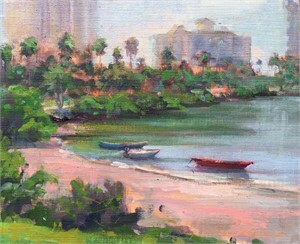 Linda Richichi says, “Since moving to the Gulf, my work continues to brighten from the ever-changing light cast across the water’s surface. 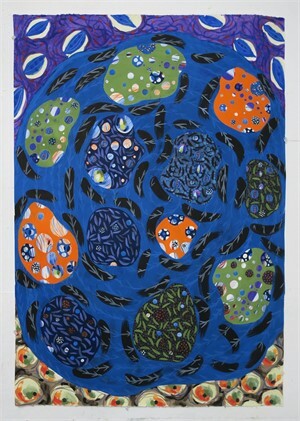 I see the evolution of a whole new color palette which explores a vast range of prismatic colors that harmoniously singing together.” The works in this show are evocative of a culture guided and captivated by the power of water. 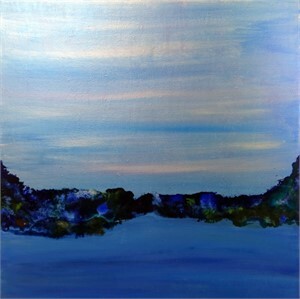 Katie Cassidy is known for her transformative oil paintings. Cassidy says, “inspired by Nature, I take the liberty of expanding and contracting what is before me. 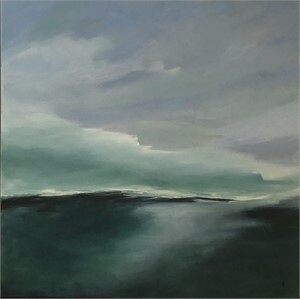 I allow myself to submerge into the imagined, uncharted, yet to be discovered, places.” Using subtle shifts in color, Cassidy obscures the brush strokes to create a sublime waterscape. 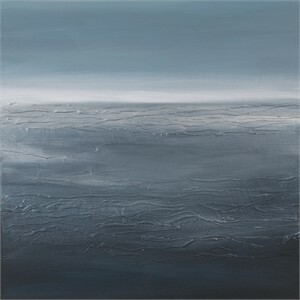 Her work takes the viewer into a new mindset, where there is an inherent calmness and sense of peace. Bettina Sego is a German-American mixed media artist, using layers of ink, acrylic paint, collage, silver or gold leaf, and resin to create vibrancy and depth in her paintings. 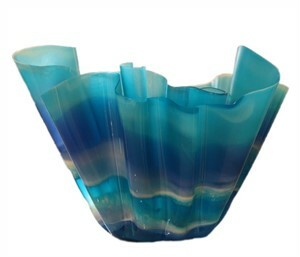 Sego takes inspiration from nature-- the minuscule fragments and layers which build to give vibrancy to natures surfaces. Sego studied in France and Germany and received a Master of Arts Degree from San Francisco State University. Moving to Florida in 2000, Sego has concentrated increasingly on impeccably combining various techniques within a natural context. 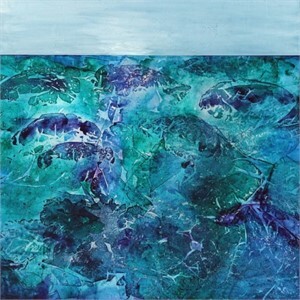 Most recently, Sego’s “Gulf” series hones in on the complexities of the waters surface and the lifeforms found within. Linda Richichi is best known for her vibrantly colored “plein air” pastel and oil paintings with layers of texture from loose brushstrokes. 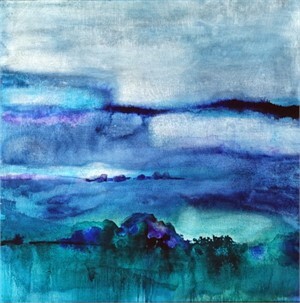 Linda continues to push boundaries and explore the spectrum of colors found throughout nature. 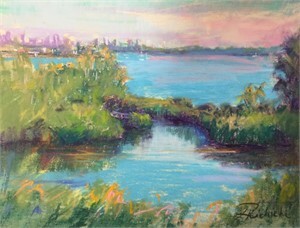 Phil Lederer of SRQ Magazine described Linda’s recent Solo Exhibition-- “Summer Solo: Linda Richichi showcases the pastel maven at the top of her form as a master of color and light, whether capturing cloud-scenes from Sarasota or the Italian countryside.” The pieces featured in this show specifically look at Richichi’s impressions of the water. For further information and press inquiries, please contact Molly Lindberg at molly@sedacca.com or by phone at 941-951-0620.